UKIP's new fascist alliance in Brussels continues to attract unwelcome publicity for Farage and his sycophants. Ukip's new friends are even more unsavoury. The party's major partner in the Europe of Freedom and Democracy group, formed at the beginning of this month, is Italy's Lega Nord, which, despite being part of Silvio Berlusconi's governing coalition at home, wants autonomy for northern Italy and has a track record of xenophobic and anti-gay statements. Other members of the group - described by Searchlight's Europe correspondent Graeme Atkinson as a "far-right-lite" coalition - include Greek and Slovak extreme nationalists. Nikki Sinclaire, Ukip's first openly lesbian MEP, concedes to having "reservations" about her new allies. "All the parties [of Freedom and Democracy] have signed up to a statement saying they oppose all forms of discrimination. But it is difficult. I think this is going to evolve over the next couple of months." The Freedom and Democracy coalition is in part a shrewd move to block the more extreme far-right parties, such as the BNP, from forming a coalition - Lega Nord was initially touted as a possible partner for the BNP. However, it creates a potentially more toxic alternative. Most of the British MEPs are now in alliances with extreme conservatives, with whom they will be seeking a common position on a range of issues, from equality legislation to the Convention on Human Rights. 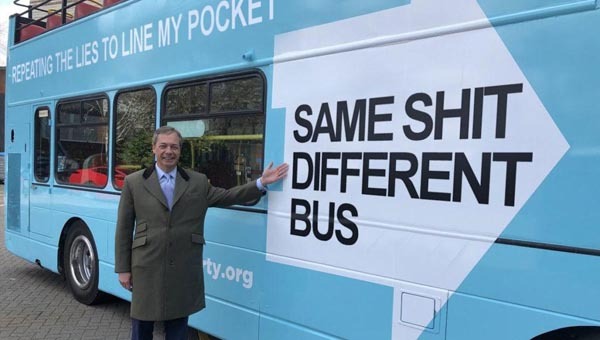 UKIP: Is naive his middle name? UKIP: Who has been a naughty boy then? UKIP: Clive Page should start to pack his bags! UKIP: Nigel Farage goes native!